Whoops! What our clumsily-rendered Goblin friends are trying to tell us there is that unlike past Meddlings, we’re throwing Rule #2 right out the window for Phyrexian Poison. Our first deck concept will be Scars and M11 only, as before. But the second- which is normally a mono-coloured version- will be something completely different: a Standard variant! There are two reasons for the change here. First, Infect is a new mechanic without a great deal of cards supporting it yet, and a mono-Black Infect deck would be a rather poor construct. And second, there are just so many great cards in the format right now that synergise well with Infect! As mentioned above, we’ll be making two versions of the deck. The first will be a Scars/M11 Black-Green deck, similar in composition to what we have but with attention given to shoring up the deck’s inherent flaws. Our second version will be a Blue-Black Standard deck. With the table now set, let’s eat! Looking through the card selection here, the good news is we’ve got a solid basis to start off with for the creatures. Granted, we’re not blessed with a ton of options yet, as this is the first set in the block, but we can still wield a bit of a scalpel and excise some of the cards not quite carrying their weight. Foremost amongst these is the Blackcleave Goblin. A 2/1 body with Haste for four mana is no bargain, and can even undermine your natural development with the tension inherent in such a card. You’ll often want to get him in directly on your opponent as a surprise move, which can delay your aggression while you wait for opponents to leave themselves vulnerable. Then, on every turn after the first you still will only have a 2/1 body for four mana staring back at you. Not much better is the Contagious Nim. Dropping the Haste makes this Zombie a 2/2 for three mana, which is better but still not all that exciting. We’ll go ahead and drop him, too. More difficult is cutting the pair of Corpse Curs. I like the potential card advantage of the Curs, and they synergise well with the Hand of the Praetors and the Ichor Rats, but they’re still a 2/2 for four mana, and they’re still conditionally effective. We’ve seen great effect from them, and just as often seen them hang about unplayed waiting for maximum value. Phyrexian Poison is not a deck well-positioned for the long game, and as such cutting the Curs- however painful- will help accelerate the deck. Having freed up four critter slots, what would we like to put in their stead? These are choices easier still! Two more Ichor Rats are first up, as their reach lends them versatility and they’re not dreadfully-costed. For an evasive boost, we’ll throw in a fourth Plague Stinger as well- it may be a fragile 1/1, but its evasion gives it significantly more weight. Finally, we’ll round out the deck with one more Ichorclaw Myr, which happen to be one of the best of the Infect Class of 2010. Their small size is made up for the fact that they have Infect (which makes them the equivalent of a 2/1 against players), and they are frustratingly difficult to deal with for many opponents in the early game, where they’re almost impossible to trade for profitably (anything they have that will trade out with it probably cost them more than the Myr). Now for the fun part- the noncreature support! 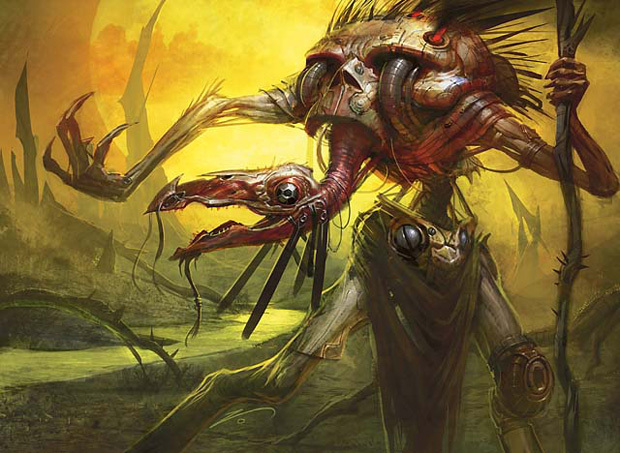 Here, we found the greatest opportunities for improvement in the deck, as the original Phyrexian Poison was a hodge-podge of Infect/poison interactions and singleton tricks. Although it’ll probably be easier to make a list of “what’s left” instead of “what’s out,” let’s go through every cut to understand why it was axed from the deck. Assassinate is a curious spell. Relatively poor as far as Black removal goes, it nevertheless seems to find itself in a great number of preconstructed decks, and we’re not entirely sure why. Almost every set has had better options, and now is no different. Both of them are out. Instead, we’ll be dropping in a playset of Doom Blades, the relative standard when it comes to cheap Black removal. The Bladed Pinions suffer a similar fate. It’s not that they’re bad cards, per se… it’s just that there are better options available. Add to that a one-shade-too-clever trick (Heavy Arbalest) and a Strider Harness, and we’ve just cleared out enough room to cut in four Whispersilk Cloaks. If any artifact begs to be included with Infect, it’s the Shroud-and-evasion combo afforded by the Cloak. Landing even just one of these on the board threatens to put your opponent on a rather unpleasant timer. Finally, we’ll use up one of the extra land slots with an Untamed Might. This is a bit of a risk/reward card, as you can easily be two-for-oned with a timely Lightning Bolt from your opponent, but the opportunity to close out games with it is too tempting to pass up. So what we’re left with now is a leaner, meaner Infect/swarm deck. The greater concentration of early critters should help you flood the board faster in the early game, while the Whispersilk Cloaks will give you paths to victory even when the red zone starts to clog up with bigger and bigger critters. The added removal should help clear an early path or deal with unpleasant threats, and the Untamed Might will steal the occasional game. Bon appetit! For our second deck, we’ll be taking a few cards from Zendikar and Rise of the Eldrazi to make a hyperaggressive Infect/swarm deck that has some extra reach in the midgame. Infect is a very intriguing mechanic and there are a number of ways to go with a Blue-Black build, but we’ve decided to reinforce the very core of the deck: getting your opponent up to 10 poison counters, as quickly as possible. To that end, we’re gutting Phyrexian Poison. Out goes the Blackcleave Goblin and Contagious Nim, for the reasons stated above. Goodbye Putrefax! Farewell Tangle Anglers! Cystbearers, auf Wiedersehen! Instead, we’ll be strengthening some of the better inclusions in the deck, adding in a fourth Plague Stinger, a fourth Ichorclaw Myr, and two more Ichor Rats, as we did above. Additionally, we’ll be adding an additional threat vector with a playset of Thrummingbirds, giving the deck additional reach if the ground game bogs down. And having trimmed enough fat to do so, let’s go ahead and throw in one more Necropede. They’re a fine early-game threat, and they synergise well with the Thrummingbirds. To make room for the extra creatures here, we’ll be cutting two land off the original list (keeping us at a perfectly fine 24). As for the noncreature support, it’s back to square zero here- we’ve cutting every last one of the fourteen cards included with Phyrexian Posion. Instead, we’ll be adding in a playset of Doom Blades for removal, four Distortion Strikes to help us get our beaters in past the guards, two Vampire’s Bites to make our opponent pay when we do, and a set of Steady Progress. Steady Progress is a solid inclusion here, for not only does it almost certainly deliver another critical poison counter to our foe, but it also nets us a card and keeps us digging through the deck. As you can see, this version of Phyrexian Posion is very tightly focused- there isn’t much room for deviation from its core strategy, but that strategy is well-supported. Do everything you can to land early bodes and get them in for a few early poison counters. Then once the ground starts to thicken up, use Distortion Strike to get past the defenses for a few more counters. Finally, take advantage of Proliferate to get those last critical counters through, using Doom Blade to either clear paths or remove threats. 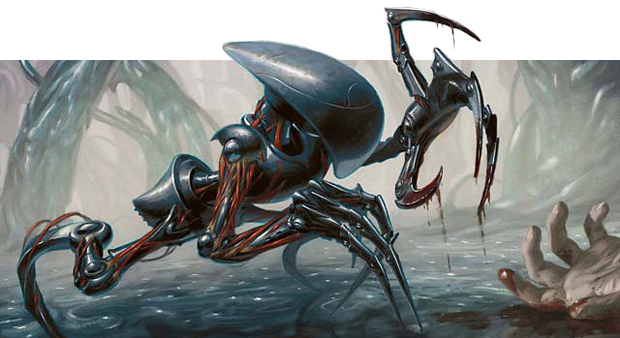 Again, this is just one way to explore the deliciously wicked Infect mechanic we’ve been given in Scars of Mirrodin. 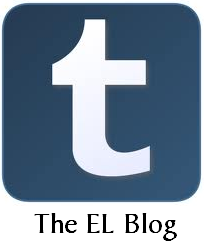 As always, we encourage you to try out other options or paths, and share your thoughts and results here. Let us know what you think! I would’ve probably gone with Groundswell or Vines of Vastwood (and probably as 4-ofs) over Untamed Might. They’re much more efficient. I’m not sold on Whispersilk Cloak as a 4-of. It’s on the slow side and not something I’d want to see in multiples or in my opening hand. Two or three at the most, and it’s probably still worse than Trusty Machete or Adventuring Gear. If you’re going to maximize Infect, you need to have power boosting, or else you might as well be running Goblin Pikers. As for protecting your creatures, well, that’s what Vines of Vastwood is for, right? I have those spells in my Infect deck, and it works pretty well. However, my deck is not blessed with a reliable opening hand (needs lands+creatures+pump) and too many of one kind will throw me off. Mulligan aggressively. Two lands + Vines of Vastwood + Ichorclaw Myr can definitely get there. Had we gone with a Standard B/G build, Vines would have been a shoo-in, and Groundswell well worth a look. As it was, only our second deck was opened up to cards from other sets, but great suggestions! I can see going down to three on the Cloak perhaps, but I still prefer its evasion ability over power-pumping. Although a little more vulnerable given the amount of artifact hate available, having an unblockable Infect critter solves the inherent weakness of the Infect critters nicely (namely, they tend to be on the small side, and easily outclassed starting in the midgame). Sure, it may help with the weakness, but it doesn’t take advantage of the mechanic’s inherent strengths (i.e. quick wins/effectively doubling the effectiveness of pump spells). 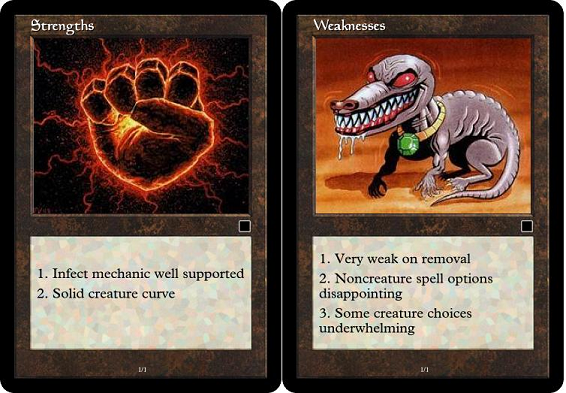 If you aren’t going to abuse that pumpability, you aren’t gaining much compared to a normal creature deck. It’s a valid point, but of course pump spells ramp up a strength at the cost of exposing another weakness- card advantage. Decks with removal will sorely deplete your hand, responding to pumping with removal and two-for-one’ing you. Weenie/swarm strategies are already vulnerable to playing off the top of the deck after expending their hand early. Credit Magic for being the kind of game that has such intricacies in play, in that both avenues have their upsides and downsides. Speaking of card advantage, I’m surprised that Infiltration Lens hasn’t come up yet. If one were to go UB infect with a focus on equipment then Trinket Mage could fetch the Lens in addition to some other great gear: Darksteel Axe, Trusty Machette and Adventuring Gear. Infiltration Lens is certainly good on Tangle Angler. Otherwise, it has a high potential to be a dead card, and even with the combo it still doesn’t do much against decks that don’t run lots of creatures. I’m not sure this is the deck that wants to be fiddling around with card-drawing combos. Most decks run creatures and infect is a very compelling reason to block, so no Tangle Angler required, imo. Also, all aggro decks have to worry about deck thinning and card advantage. A play set of Trinket Mage with some axes, machetes, adv gear and a couple of lenses accomplishes this nicely. Why not throw in a Contagion Clasp in there? It kills early threats and allows you to re-liferate. Sleep might be equal to a Untamed Might in terms of game-ending power. And try Preordian; it’s the Lightning Bolt of Blue. Virulent Swipe will be a nasty surprise for those who try to block your Necropedes. I like the Proliferate artifacts, but am still not sold on their speed. It’s a nice trade-off, though. Sleep is a winner, and upon further tinkering probably something I’d try and work in- I’ve just had such good experience with the card overall. Preordains are very solid… it’s funny just how small 60 cards can be when trying to get in everything you’d like! Good stuff! If I may add one rare in there, an Inexorable Tides will stabilize you for the middle game. It’s running for a dollar on most sites. I’m torn on the corpse curs…I tend to agree with your evaluation, but I’ve seen it come in handy more often than not. Beyond that, I have to agree with Troacctid on the Cloak. In theory it’s great here, but I’ve tried using it in a number of decks…it seems slow enough in practice that I’d go with 2 here. A card I found to work extremely well in my Infect deck is Strider Harness. What makes creatures like Putrefax and Skythyrix so popular is Haste; the Harness grants that, plus a nice +1/+1. As with most aggressive decks, taking a turn to tap out and cast something that doesn’t immediately improve your field presence is painful, but very worthwhile when your Cystbearers and Plague Stingers start swinging when they hit the field. As for the first deck, infect is a pretty dreadful mechanic. In fact infect [sorry, that one had to be :-)] can make the opponent consider every move twice … and that’s where we’re on the black slice of the color pie. The removal added is great as it clears the path for our horrors when it’s crowded. Therefore I agree with the critique on the Cloak: Why so sneaky? We don’t need to hide but can head right into hands-on combat with our critters as we can be sure they will leave their scars even if they don’t survive. I guess that is the right attitude this deck needs to be played with. Don’t get me wrong, I like your idea of going the unblockable way, but for flavor reasons, I’d rather add some proliferate to kill off some already wounded opposing creatures. Additionally, the Axes are hard to get rid off and can help making our monsters even more dreadful. Another thought on the Corpse Curs: After an early rush, the deck might run out of fuel. So why not keeping the option of getting a wasted infect creature back. Not only is it a color-neutral Gravedigger, but it loves to rush into battle on it’s own … I really should like to see one or two of them kept. There’s a ton of upside and synergy in the deck with the Curs, it was something of a ‘going-out-on-a-limb’ choice based on the fact that I’ve frequently had them stale in my hand in games too. That kind of conditionality automatically makes me suspect of a card. That said, I’ve had some very strong plays with them, and they’re eseentially a combo kill when you happen to have both of them at the same time, keeping one in your hand and the other thrown into battle. Especially if you have the Rats and the Hand of the Praetors about, too. You certainly would not be making a bad choice to keep them in. For the first deck, I know it’s not the greatest spell there is, but I think a pump spell like Giant Growth would be pretty good to help you get to 10 poison more quickly. You could even throw in a set of Llanowar Elves to ramp into a possible turn 2 Cystbearer, and since the deck doesn’t have any 1-drop permanents they can work. You could leave out Tangle Anglers, removing defense for a more “All-in” strategy. Giant Growth is already in the deck. For the Llanowar Elves, they may be good, but I tested my strong poison deck with the Elves and they were dead by the mid-game. Doesn’t fit the poison theme. For the Tangle Anglers, you can remove them, but generally I like the lure ability they have, allowing you to rush in with your infect creatures unhindered. At a tournament this week, I played a guy who was running the RG Infect deck from the mothership, and he had a neat piece of tech I hadn’t thought of in thr form of Livewire Lash. Equipping your infecter with the lash, and then targetting the infecter with a pump spell makes it a poison counter launcher. I died to an equipped cystbearer in one game. I really like the first deck because it’s powerful, but the UB standard one isn’t even good enough for casual play I think. Just think about the players whocasually maindeck Bolt, Burst, Blaze, Trail, etc. Pump spells or Turn Aside become necessities. Ah yes, Livewire Lash… It’s a great card and I have some experience with it overall. In my playbook, It’s strictly better than Heavy Arbalest and it somewhat compensates for the 2-1 cost of pump spells. I really like the addition of Distortion Strike and Steady Progress. In my local play group all of the successful Infect decks strike early, and then proliferate for the win. I have to disagree that the proliferate artifacts are slow. Throne of Geth is cheap, fast, and efficient, especially of you’re using Ichorclaws and Corpse Curs. If the battlefield is getting clogged up they make good fodder for the Throne. You can also do a one two punch with four mana into a Contagion Clasp that is then sac’d to the Throne. * Neurok Invisimancer: Though he might not be the set’s top pick in blue, he is a true late game option. Having drafted the Infect archetype myself, I know it can be frustrating when failing to deliver these last two counters because of the board situation. Enter the man that shifts frustration from one end of the table to the other one. Neurok Invisimancer is just plain worse than Distortion Strike or even Crafty Pathmage. He only makes one guy unblockable once, and after that he does pretty much nothing. Not if the deck is using Tainted Strike. I agree the Invisimancer is frail, but most utility creatures are and so are the rest in an infect strategy. 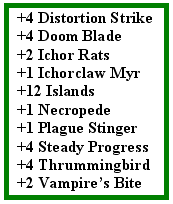 As I said, I consider the Invisimancer a late game option, a 1-of would suffice in order not to waste too many slots. His ETB effect is a one shot, but on the other hand we are not talking about 20 life to be reduced, but about 10 unremovable poison counters to be placed. I absolutely LOVE what you did by turning it into a Blue/Black. However, I’m reluctant to sway from m green/black build, as I’ve thrown in a playset of Giant growths, to bring the number up to 4, and tw overruns which are positivly NASTY. When I throw down an overrun, i the game even lasted that long with the ammount of giant growths I have in the deck, it’s the game ender, every time. +3/3 and it addstrample. Positivly sick in an infect deck. What are your thoughts? 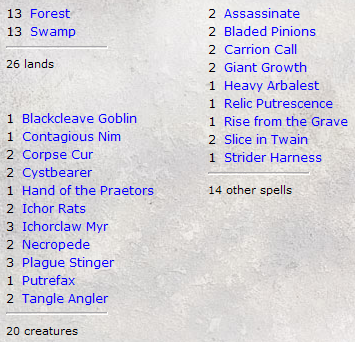 As often as not, an Overrun- with or without Infect critters- ends games outright. It’s a brutal spell, made even nastier by Infect! Alas, this is a situation where the Standard version- Overwhelming Stampede- might not be an adequate replacement, since few Infect creatures will have much in the way of Power to take advantage of the Stampede. For those who don’t worry about their decks being Standard-compliant, it might well be worth tossing a couple in- there’s plenty of fat that can be cut from the stock decklist! Now that I wonder… Do you think that they didn’t reprint Overrun because of Infect? Might of Oaks.. The developers said that Rancor got kicked from M11 for being too strong with Infect. Might of Oaks would have been met the same fate, I’m sure, if it had ever been in the running at all. Overrun might have been axed for unrelated reasons, though–for its effect on limited, lack of space at uncommon, or just to shake things up. However, I agreee, Overrun is what MaRo calls not a win, but a win-more card. 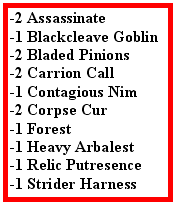 Deck 1: I ran into someone at the Scars release tournament who was playing the Heavy Arbalest on a Soliton and was only limited in the amount of damage he inflicted on his opponent by the number of islands he had. Of course, there are plenty of combos that will untap a creature. I’m still not a big supporter of any sort of equipment because of the delay in use despite how special they might be. I’m looking at the Whispersilk Cloak here because it takes 5 mana to finally be useful. Deck 2: So, I know that the Meddling rules involve only commons and uncommons, but the combination of Mimic Vat and Putrefax wreaks absolute destruction. Anytime, I pulled up with that combo during the Scars release event, it was game over. However, they are not conditional cards (if this then that), so they hold up well on their own too. I like the Untamed Might aspect because it can be a quick game ender, but I also think that Giant Growths can produce the same effect in a pinch. 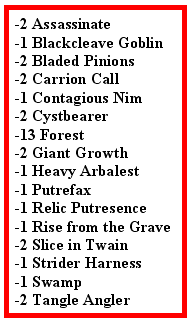 Putrefax + Mimic Vat is certainly a bomb, but infect decks are usually looking for a very quick win. That setup requires at least +5 turns to pull off, which is too slow. You will have either won or going to lose. However, it is viable for the mid-game.. If your infect deck is not winning, this combo may viable to let you win, even when your winning turns are passing. I agree partly on your opinion on equipment – the cloak certainly blocks too many resources here. But I think, that especially low cost gear (in terms of both, casting and equiping cost) such as Bonesplitter, Bonesaw or Darksteel Axe might make a difference here. I’ve looked through the new SOM cards a few times to see if any combo-cards stick out but I think because I’m not an instant infect fan it’s been hard to see amazing possibilities. The more I look at it though the more I see how it can be a fun mechanic to play with but I’ll need to get some actual play time in and see. The aspect I really like about it is having the ability to wither down the opponent’s creatures but since I’m just getting back into the game I’m all sorts of casual and I think that’s a pretty casual approach heh. In regards to the mettling, I was thinking what are your thoughts about including a couple withstand deaths for the first deck? The majority of the creatures included are pretty small and, although your main strategy seems to going in unblockable for the poison counters, being able to use infect to actually act against creatures in parallel to the poison counter ability may help on the creature defense front. I just picked up the Phyrexian Poison deck, and I’m thinking of applying Ertai’s Meddling to it. The first deck, that is. But is it wrong that I’m tempted to toss my Skythyrix in there? Perhaps as a replacement for one of the additional Ichor Rats. Skithiryx is a bomb. It’s just ineligible for Meddling because it’s mythic. So I retract the previous statement. Meanwhile, I'd be more likely to keep 2 Corpse Curs in lieu of the 2 Vampire's Bites. i went 8-4 tonight against various casual opponents on MTGO with the 2nd meddled deck. it just shredded people. vampire’s bite was just silly good. great synergy between the cards, nice being able to work the strategy from more than just one angle (by adding the proliferate, or going in the air or etc…). i hammered koth and outraced green ramp decks. IMO, running a mono-B infect deck, I really prefer Grasp of Darkness to Doomblade simply because it’s non targeting restrictions. In addition, -4/-4 is usually good enough to take care of anything early game that you’re going to be facing with your Infect aggro AND comboes well with any infect creature as they’ll already have -2/-2. Vampire’s Bite is awesome as well in an Infect deck, especially in mono-B because not too many people expect it.